8 Comments on Baby, It’s Cold Outside! The answer so far: Yes, and I’m not the only bike I see on the streets. A slight downward trend in temperature seems to be developing, dear readers. One of the ways I track the change of seasons is my layering: on for winter, off for spring. Kind of like a dog’s undercoat, if you have one of those shedders, although at least my extra layers don’t end up all over the furniture and your dark pants and clogging the vacuum. 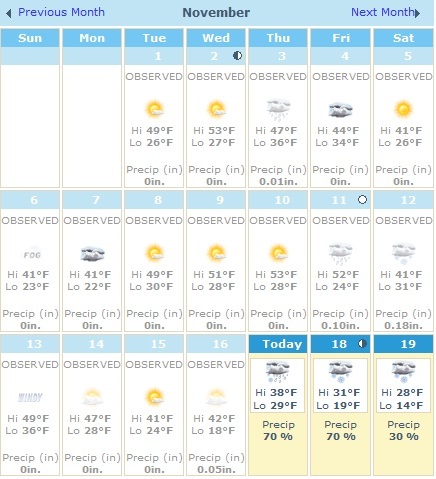 The temperature drop from last week’s riding to yesterday morning is quite a swing, so it’s time to grow a winter coat. Wednesday Nov. 9: Sunny, a touch of frost in the air in the morning with a high for the day of 51 degrees and zero precipitation. Clothing choices last week looked a lot like those of the weeks before: skirt, wool tights, dressy walking shoes or boots, sweater, jacket or blazer. I had started wearing lobster-claw gloves some mornings but could wear full-finger regular gloves riding home. (I don’t wear the lobster-claws when temps are above freezing because they make my hands sweat.) On my head: Helmet with helmet cover and knitted ear warmers, and a face cover just for the morning ride. Wednesday Nov. 16: The mercury stood at 18 degrees when I left the house at 7:45 a.m. I rode through sunshine first thing in the morning through midday, then later under lowering gray skies foretelling the sleet that would start falling around 6 p.m. or so. Clothing choices: Not quite enough on my legs! I wore thick wool socks and a pair of light Helle Hansen long johns under a long gray wool skirt and boots. On top I wore a Thermasilk base layer and an incredibly thick gray wool sweater I bought years ago, along with a scarf. I wore the lobster-claw gloves—no messing around with full-finger gloves that would have left my fingertips hurting—and added a skullcap under the helmet/ear warmers/helmet cover, along with the face cover, which I wore on every ride throughout the day. This felt like enough inside the house. When you dress for cold-weather riding–similar to cross-country skiing or running–you don’t really want to be completely warm when you leave the house because you’ll overheat as you start moving. You do need to plan for wind effects, though, since you’ll be making your own. What I hadn’t anticipated was that the long skirt had to ride up a bit for the pedaling action so my knees were exposed in nothing more than those thin long johns—no wind resistance whatsoever and it was cold enough to sting before I was halfway to work. The thick sweater with underlayer seemed to be enough on top; I might have added a high-visibility windbreaker vest but I was fine. As cycling friend and founder of Belles and Baskets Betsy Lawrence has said, it’s not as if they’re going to find my body a cold, frozen lump when they defrost the streets next spring. I live 2.5 miles from work—in a house I chose in part based on ease of commuting via bike and bus. Even with the wind-chill factor the odds of me dying or getting frostbite in a 9-minute ride to work? Pretty slim. Total bike time for the day, by the way, is worth noting for those people who assume (or insist) that biking for transportation only happens on the nicest of midsummer days. The bike time is actual pedaling time per my cyclometer; it doesn’t include time waiting at traffic lights, but I wait the same amount of time drivers do so I don’t think of it as a factor in travel time comparisons. But wait! You clever, logical people, you—you will notice that this list doesn’t mention riding home at the end of day. Nope. Dearest Sweet Hubs picked me up after my final meeting of the day in his pick-up. My taillight battery was dead, it was dark, the forecast was for snow, he had driven to work instead of biking because he’s still fighting off a heavy cold, and my meeting location was conveniently located on his route homeward. I list all those facts because of course I need an excuse for not riding home, right? If you’re inclined to pounce with an “Aha!” because I didn’t ride home I will look at you blankly. I suppose I could have ridden home with no taillight, but ninjas are dangerous. I could easily have thrown my bike on an STA bus (they all have racks) and made it home. No one should feel obliged to apologize for carpooling. But most importantly, I write this blog in part to help people realize that riding a bike for transportation has to work for you—and it can. If it will make it work for you to ride your bike for part of your transportation needs, and to use a vehicle for the rest of your needs, then do it. No need to apologize. Forecast for today: Low of 29, high of 36, possible snow. Stay warm out there. What are some of your favorite bits of gear that help you keep riding into the colder weather? Will you keep riding when there’s snow on the ground? Shoe covers! As long as my feet are warm, I am a happy camper.